Abraham Fraenkel, 1954. Introduction to Mathematics. Problems and Methods of Modern Mathematics. 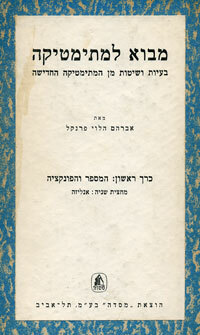 Volume I: Number and Function, Massadah: Tel Aviv. This section of the exhibition displays copies of classic monographs, influential textbooks, and in some cases the collected works and papers of German-Jewish scholars. The list of authors and writings covers a wide variety of mathematical fields and their applications. It completely disproves anti-Semitic stereotypes that had claimed the existence of a typical form of "Jewish mathematics", remote from geometrical intuition or from applications. Displayed here as an example is one of five volumes of Abraham Fraenkel's Introduction to Mathematics. Abraham Fraenkel (1891-1965) worked mainly on set theory and the foundations of mathematics. His introduction to the foundations and development of modern mathematics was the first of its kind to be written in Hebrew.